His results corroborate the findings of all other researchers and illustrate that, for a similar interchannel intensity difference, the position of a high-frequency sound and a low-frequency sound are different. His experimental set-up is illustrated here. The EMI team who developed Blumlein's patent into a practical stereo system after the war that killed its inventor found the same phenomenon but were unable to explain what might be causing the differences between imaging at low and high frequencies. Their solution was empirical and practical - after all, their aim was not to win academic plaudits, but to develop a commercial music recording system. where R and L represent the untreated stereo signals and L' and R' represent the post processed signals. In the EMI equipment (and this was used right through the nineteen-sixties as documented in the seminal study of EMI's Abbey Road studios technical gear, Recording The Beatles), the matrixing was done in balanced, transformer circuits. The filters and phase-compensation circuits are illustrated below. The famous EMI REDD.51 console... "The Beatles console". Inexplicably dumped in the early nineteen-seventies, none of the Abbey Road machines has ever surfaced. Channel-intensity panned stereo mixes, stereo recordings made with crossed cardioids and cosine (figure-of-eight) microphones, and those made with ORTF and NOS pairs are all "broken" without modification of the channel intensities with respect to frequency. A visual analogy of the effect is illustrated below, which shows how, as the sound image gets further from the centre, it is split into non-coincident, high-frequency (blue) and low-frequency (red) spatial components. The REDD team who developed the Stereosonic mixers for EMI was disbanded several years before the REDD mixers were disposed of by EMI by the stroke of an "EMI accountant's pen" (see Recording The Beatles), to be replaced with TG12345 consoles. No one knows what happened to the REDD consoles from Abbey Road; although, happily for posterity, one example still exists - from EMI's Milan studios - in a private collection. 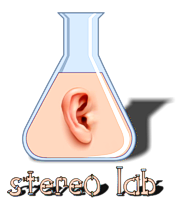 The Stereosonic Shufflers, of course, went with the REDDs, and with them the foundation work done by Blumlein, Clark, Dutton and Vanderlyn on the necessary corrections for stereo. To be fair, the Stereosonic Shuffler filters had gradually fallen into disuse with engineers even before the REDDs were disposed of; partly out of misunderstandings and ignorance, and partly because of colouration artefacts which they introduced as a consequence of the implementation and the almost impossible requirement to match group-delay in the sum and difference channels; leading to comb-filter effects when matrixed back to L' and R' signals. FRequency-dependent, ANalogue Crosstalk Injection Network for STereo Image ENhancement.